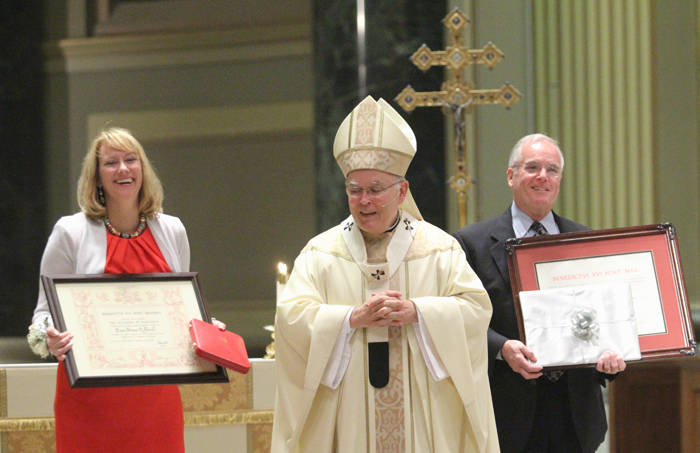 Donna Farrell and Dr. Richard McCarron receive papal honors from Archbishop Charles Chaput June 2 at the Cathedral Basilica of St. Peter and Paul, Philadelphia. 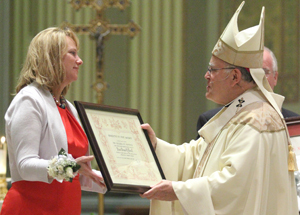 Donna Farrell, the former communications director for the Philadelphia Archdiocese and Richard V. McCarron, former archdiocesan secretary of Catholic education, both received papal recognition at a Mass celebrated by Archbishop Charles J. Chaput June 2 at the Cathedral Basilica of SS. Peter and Paul. The honors were among the last acts of Pope Benedict XVI before he resigned the papacy last February. Archbishop Chaput conferred the honors personally to the two recipients during the Mass, attended by their families and friends. McCarron was advanced to the rank of Knight Commander in the Order of St. Gregory the Great, which is one of the highest honors the holy father can bestow on an individual. He was previously appointed to the order in 1998 by Pope John Paul II. Before his retirement early this year, McCarron served as the secretary of Catholic education for 12 years, overseeing 17 archdiocesan high schools, four schools of special education and more than 160 parish elementary schools. He also managed curriculum, religious education programs, youth groups and the Newman Apostolate on behalf of the Archdiocese. His retirement early this year capped a career of more than 40 years as a teacher and administrator in Catholic education. 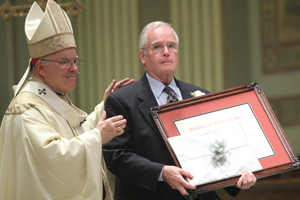 Farrell was given the Cross Pro Ecclesia et Pontifice medal, the first lay person to receive the honor since 2003. It is given to Catholics who have shown distinguished service to the Church and to the pope. Currently the Manager of External Affairs for Independence Blue Cross in Philadelphia, Farrell began working for the archdiocese in 1998 and served as the director of communications from 2005-2012. During her tenure she devoted countless hours to managing internal communications and media relations surrounding many of the largest challenges the Archdiocese has ever faced. Her work also highlighted the good works of the local Church and promoted Catholic values and teachings. Read more about both recipients and their awards. 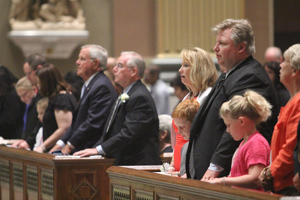 The Farrell (right) and McCarron families participate during Mass.